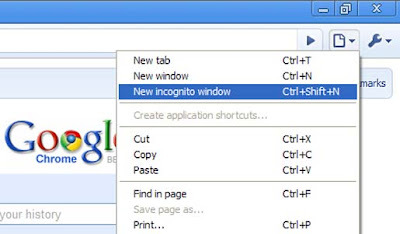 How To Enable Private Browsing In Google Chrome ? Even not one day is completed since the Google Chrome has been launched but the blogs in the net is filled with tips and tricks. Now i am going to give some tips and tricks about the Google Chrome. A feature called New Incognito Window in this browser enables the users to surf and browse the net in a private mode. This feature is already given in Internet Explorer 8 called InPrivate browsing. To enable the private browsing mode in Chrome Browser, you just have to click on the file menu and click New Incognito Window. If you feel this difficult just use the Ctrl+Shift+N shortcut to enable this feature.